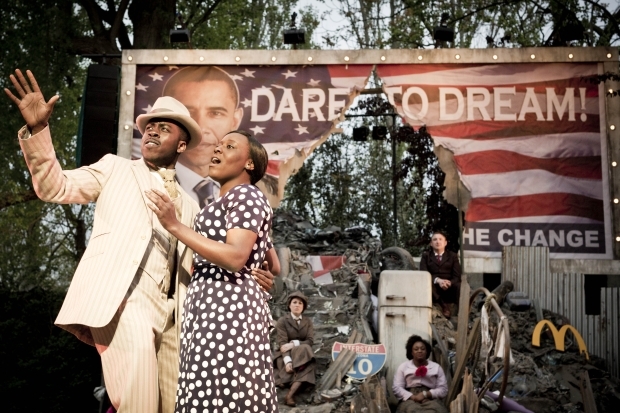 With The Hollow Crown and Danny Boyle’s Olympic Opening Ceremony giving British audiences the chances for two very different examinations of the national character, it seems almost unpatriotic to be reviewing Regent Park Open Air Theatre’s production of Ragtime – a musical that places itself firmly within that staple of American drama; the great American narrative. Adapted from E.L Doctorow’s mid-seventies novel, Ragtime offers a panoramic view across early-20th century America. Blending fact and fiction , the musical weaves a loose narrative through the eyes of three rather generic stock characters; the middle-class housewife whose values are transformed through a life changing event, the eternally-optimistic immigrant who only cares about making a life for his daughter and the black musician struggling against institutional racism. 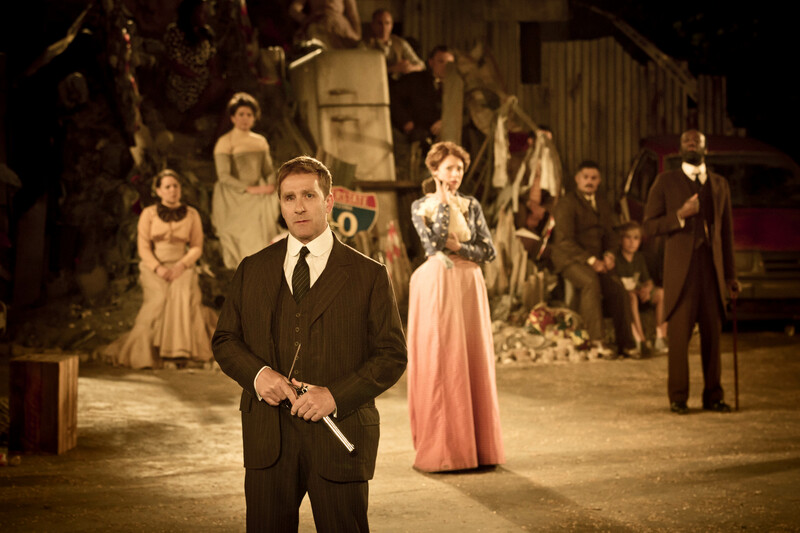 Under Timothy Sheader, the Regent’s Park Open Air Theatre has taken home the award for ‘Best Musical Revival’ in each of the last three years. Stunning productions of Hello, Dolly!, Into the Woods and Crazy for You meant that his 2012 choice was eagerly anticipated. Despite a reputation for bold takes on American classics, Sheader’s production of Ragtime proves itself to be a rather more awkward piece of work. The tableau approach creates an uneasy balance between fact and fiction, with key events seen through the eyes of Ragtime’s characters whilst historical figures rub shoulders with fictional creations. The plot is a fairly transparent call for social and racial equality and, originally written in the 1970’s, is clearly laudable in its aims. However for those not well-versed in early 20th century American history it was slightly frustrating for never being entirely sure which scenes were real and which imagined, which characters were based in reality and which were the authors invention. Ragtime’s closest comparator is Gershwin’s masterpiece Porgy & Bess; both are interested in showing audiences the experiences of marginalised members of American society. However where Gershwin was able to put faith in the strength of the music and the lyrics, through songs that have become integral parts of the 20th century canon – Summertime, Ain’t Necessarily So and I Loves You Porgy – Ragtime is not able to draw from such a well. Despite fine moments the play lacks depth and delivers the narrative in a halting and didactic tone. There are some great moments in the play. Rolan Bell brought a powerful dignity to Coalhouse Walker, the frustrated black musician, and was blessed with the type of voice that makes you think of vocal cords draped in velvet and which lent real emotion to the two duets with Claudia Kariuki’s Sarah; Wheels of a Dream and Sarah Brown Eyes. In these magical little moments Ragtime echoed the subtle grandeur of Gershwin and drew a stillness from an audience wrapped up in the impressive cauldron of sound that always seems to emanate from the amphitheatre-like surroundings of the Open Air Theatre. Unfortunately for much of the rest of the production the cast were forced to battle against a weak plot that smacked of author inserting polemical views into the mouths of his characters. It is a tactic that need not be problematic but requires a far more finessed hand than at work here; numbers like Justice were memorable chiefly for the naivety of their aims and the weakness of their lyrics. Some of the heroic characters give voice to opinions that are surprisingly modern in tone and appear to have benefitted from six decades of hindsight; the role of Mother in particular becomes a very unlikely champion of racial equality. This becomes an issue due to the unexpectedly tough narrative, where tragedy never lies far from the surface. This tragedy needs to be underpinned by realism in order to allow the audience to suspend its disbelief but the creation of unbelievable characters continually undercuts this, as does a number of tonal imbalances that chip away at the serious intent of the main narrative. The subplot of the relationship between Mother and Tatah, the immigrant, seems to run entirely separate to the main action and at no point do the two stories gel together. The play finds itself forced to introduce an epilogue that provides a strangely jaunty summation of the characters’ (both real and imagined) futures which is entirely at odds with the central tragedy of the final act. Throughout it appears that Sheader is not entirely sure how he wants to play it. 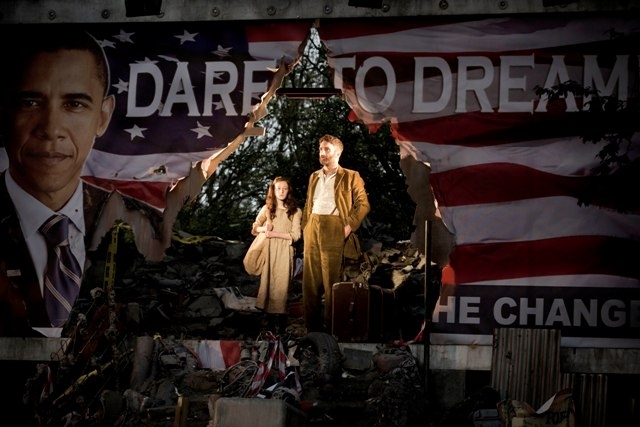 There are nice lines and images throughout the play; the Children’s Crusade is particularly well done and there is a crackle of energy whenever Bell’s Coalhouse is centre stage but it never manages to strike a comfortable balance between the slightly comic air given to some of the characters and the necessarily repellent racism that drives the plot. The problem may rest with the play or with the difficulty of translating a period of American history – the early fights for civil and social rights – that is not very well known to British audiences. There is much to enjoy – it is slick and well-staged, and throughout the cast there are solid performances but the overall impression is of a story that does not what it wants to be and a production that isn’t entirely sure what it wants to tell us.